For any of you who doesn't know what Castle Oblivion is, well, CO is an RPG serie originally created by kelarly. 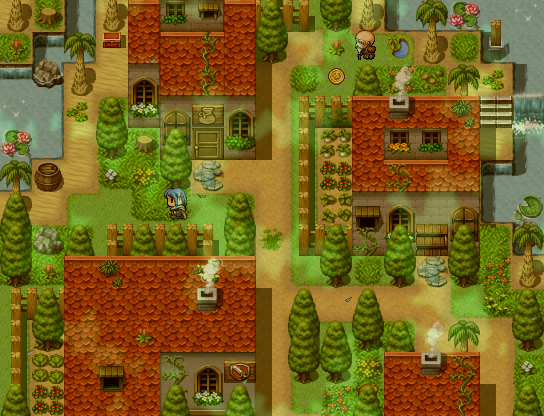 The first game was started on may, 2007 and quickly rose up in the RPG Maker VX spotlights and turned out to be a great adventuring game. The game gained popularity fast and soon became a famous RMVX game. By the upcoming year, a sequel got revealed and is simply known as "Castle Oblivion 2". In CO2, kelarly aimed for another epic adventure that should have lots of new features and twice as better gameplay as the first one! It was improved by it's prequel and had a continuing plot to the previous major character. The game got famous as well and the fans were really happy and couldn't deny that the sequel turned out just as great as they thought. By the years, the series got more and more fans but later on, no sequel was released. A young man known as "PKPwnr" decided to make a fan made sequel to the series, a game that should be known as "Castle Oblivion 3". In order to keep the series from "disappearing in Oblivion", this man started the game but eventually, the game got deleted and thereby cancelled. It was never showed in public, only heard of. A scientist known as Evan has his own hobby of exploring places all around the world. A rumor has been told that a treasure is hidden somewhere on a very rare island that is said to be hidden deep within a fog so thick that not even the eye of a deaf captain could see it. As the young scientist prepares to sail out in the sea in hope to find the hidden island, a greater evil awaits them that neither Evan or his companion are aware of. Will this treasure hunt turn out as it was expected, or will a drastic wave change the course of this adventure? life and make sure to live everyday as if it was his last..
truly has a kind soul. great treasure on the island! little we know about, yet so much to find out. be a bit rude at some points, at least if you're not her father or sister. Perryn Village, a little village surrounded by beautiful nature and life. A hidden room inside an old temple, interesting..
Gyron, a more of a criminal town. Nowadays home for thieves. It's always good to spend some gold at an item shop before entering the wild. A hot day and a hot battle! You didn't think that the castle looked scary? This shows the true image of what the castle really is. - A mysterious castle filled with over 9 different worlds to explore! - Exciting and climactic story with twists! - Fun gameplay with a good mix of exploration, battles, puzzles, scenes and more! - Well mapped areas with beautiful, creepy, mysterious and unique atmospheres. - Minimap system that displays in your upper left corner which you can turn on/off at almost any point! - Secrets! Hidden arrows, items, skills, bosses, rooms, side quests and all kinds of goodies! Gives the game a good replay value. - Multiple endings! A bad and a good one. Big thanks to you guys! working on it. Nevertheless, it has been done, so... Well, what are you waiting for? Go play it and have fun already! learnt a lot from it, both in and outside development. I really hope that those who decide to try out the game will have a good time. Also, don't forget to let me now what you think about it and of course, if you encounter any bugs or whatnot, just let me know. Seems like an interesting project! I wish you the best of luck. This looks good, I played the other Castle Oblivion games, I never got around to finishing them though. But I'll be keeping an eye on this one (although I already have been on youtube). Do you plan on releasing a demo? Thanks, I'll be trying my best to finnish this game. Haha, you're not the first! Yes, I do plan to make a demo, but I want the public to choose where and what the demo should be covering. I'm just waiting for some feedback and then, I'm going to make a poll about the demo. You make really good use of the default tileset, I love your maps. The game feels very RPG-esque, with the desert town of thieves (kinda reminds me of Ragnarok). Looks promising! Good luck with your project. You won't be folding stars. Your mapping style's incredibly good despite using limited resources; kind of where I'd like to be at. Definitely makes your game stand out. Thanks! I wanted to use the RTP because it's a bit challenging but it's better then having thousands of others resources. Thank you! I wanted to try out to reach the limit of the RTP tiles and I'm really satisfied with the results! I will try to finnish this game and make it a really great RPG that will be remembered. I have a demo in progress that I am going to post here soon. The demo is meant for trying out the gameplay and for some of the main story. The demo covers about 1-2 hours of gameplay and has the intro in it but it's skipable for those who doesn't want to get spoiled. In this demo, you will encounter the very first floor of the game! There will be story, battles, adventures and even some puzzles! Here's a video of the first floor and some screens from the demo as well. Just Evan running around in a forest like area in search for a shrine. A battle! CO3 is using a modern sideview battle-system. Even regular NPC's have their own stories and problems. Your mapping is fantastic. I didn't watch more than 10 seconds of the video though, I don't want the initial awe to be ruined. I'll be waiting for this demo for sure. You've made the RTP Look good! Thanks! The video sure shows much of the first floor so it contains spoilers. Thankies, I tried my best and I guessed it payed off. UPDATE! DEMO HAS BEEN RELEASED! Here it is, the demo for CO3! It's been lots of work and now it's finally time for me to release something in VX. -About 2 hours of Gameplay. -Preview of the Intro and the first floor in the game. -Lots of fun story and gameplay. It's EPIC, don't miss this! Please, make sure to tell me what you thought of the demo once you've played and if you encounter any bugs or glitches, report to me so I can fix them as quickly as I can. It's looking a lot better than the start off. Your skills are growing. Okay, I've gotten all the way to the first shrine or I like to call it forest temple and got stuck. I even bought a lantern, but unfortunately, I couldn't use it on those unlit torches. Let me tell you what I think of it so far! I'll start off with the most ANNOYING aspect of the game. "Hello. . . . . . . . . . ." Me: "Hello. . . . . . . . . . ." (I'm wondering if a bug occurred during that long wait or an awkward silence was born. This is not only for the npcs, it's for well... almost every single event. The battles are just right however, although wouldn't you consider sickle weasel to be a bit took weak? I used it once and it only took around 10 damage on each enemy which really wasn't worth it. So far the story is shaping up really nicely. Hopefully I'll figure out what to do in the first shrine, although that monster was really unexpected. I would expect it to appear at the end of the shrine, maybe... BUT RIGHT IN FRONT OF THE ENTRANCE with that rude merchant just watching me!? Oh you must mean from my previous post. Thanks! That Title screen is beautiful... Not to some feedback. > You should find a way to remove that Save option from the menu, because you can't even use it and there are crystals. Some grammar could do a bit of work, but a quick review of the text would resolve most common issues. It's been said multiple times already, but your mapping skills are fantastic. I think you should change the name of the game's currency, because a Gold Coin can be sold for 500 gold, yet it takes 350 gold to buy a Spear . The map buying feature is really cool, although I like keeping the map a surprise, so I doubt I'll be buying any maps until I've first discovered them by myself - The Gold coins are quite useful if I do say so myself, but I'd be cool to have some in places that aren't visible by the player (unless you already are doing this), although that sounds quite sneaky, it was used in Paper Mario Thousand Year Door to find Star Pieces and it was still fun finding them all. Wow, so much Zelda music, you're gonna make me replay Twilight Princess for the fourth time.. You tell the story very well, but the grammar errors do tone down the emotion at times, they should be fixed as soon as possible. The battles are quite difficult, but that's not a bad thing, I trucked through those pesky slimes like a champ and kept on going, the game is paced very well and the story is great. I'm loving it, I couldn't put too much feedback into this sadly, because I have to go somewhere at the moment. When I finish the game, I'll probably come back and finish my feedback, but great job so far, I've stopped at the shrine and will surely be back soon. Thanks for your feedback, I'm glad you're enjoying my demo! I've fixed alot of grammar and tried my best and it's pretty obvious that English isn't my first language. The battles are supposed to be challenging, especially the bosses. Good luck playing the rest of the demo, I can't wait to see more of your feedback! Is this game still going? I mean, it has a Megaupload link... And no recent updates. Yeah, it's still in progress, just haven't checked the game topics in a while. I've made a lot of progress since last and I am aiming to make a new topic of the game on rpgmaker.net which I will use as a main topic where I'll host a new updated demo and as well update often! Good, I've essentially migrated to that site. Whooo Hoooo! I loved the other two games, and was hoping to have a chance with this one some day. Good to hear it's still going. NEW VERSION 2.0 DEMO RELEASE! First off, for you who have downloaded the demo and got the Cave Parallax error, please download this, extract it and then paste it in the gamefile. This is the new version of the last demo I posted. Some of you might have already played but I knew there were some people who wanted to play but couldn't because the site I submitted the download had been down. -About 2 hours of playtime! -Fixed from bugs and glitches. -Dungeons, puzzles and tough but balanced battles! Clareain_Christopher's Let's Try of the demo! I have been criticised about the Demo and there will be stuffs I'll fix for the full release. The two main things are game's pauses and bosses. There won't be as much pauses between dialogues and events in the full release but keep in mind that I won't ditch ALL pauses completely. About the bosses, they will get their HP lowered so that they don't get too long or to draggy. They're still going to be hard, just not as long as they are now. Now that the demo is up and all that I'll try to get some more progress on the actual game as the time flows. My goal is to complete this game before 2013 and I believe that if I work hard, I'll make it up! I hope you guys will enjoy the demo or maybe you already played it? Feel free to give me tips and let me know what your thoughts were about it. See ya next time then! Just wanted to inform you that this game is nowhere close to being it dead, it's actually sort of finnished. I'll give you more info about it soon. I just wanted to tune in here to confirm that I'm not dead or something! I really hope this community is still alive! "I have found the one whom my soul belongs to." Just wanted to let you know that I have been playing the game (4+ hours) and really enjoy it so far. Besides for the choice of language you used, the game really does entertain and is definitely worth to check it out. Great job on this project! Greetings, my fellow RMRKers! I'm happy to announce that the secret bosses I talked about a few of months ago are finally released! There are a total of 10 new optional and challenging boss battle as of this update! Can you find them all? Or even better, can you defeat em' all? Only thing you'll need to do is to download the new patch and replace the Data File with the old one in the game folder. If you'd happen to have any troubles, feel free to comment or send me a PM. With that out of the way, I'll continue back to work on my future project(s). There might be even more coming sooner than I expected, so DEFINITELY stay tuned for more updates! A few days ago, SerenityCrystal, finished up a walkthrough for CO3! If you ever feel stuck in the game, I recommend you to check it out! Hope it will come in handy for some of you out there. Also, huge thanks to SerenityCrystal for uploading all 106 parts of the walkthrough!